How LONG will my old MAGIC BRIEFCASE live in the restaurant? After many, many, MANY years of saving JUNK, my mom has decided to CLEAN HER ATTIC! 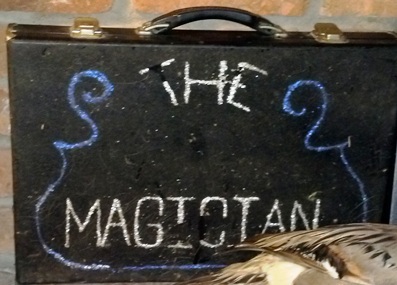 She found my old "MAGIC BRIEFCASE" I used when putting on cheezy magic shows for friends and family. That old briefcase has been in my mom's attic for better than thirty years. She brought it to a dinner party at a restaurant Saturday night, May 12, 2012. "Here's your magic briefcase! You can give it to your sons!" That old briefcase isn't in the best of shape, mind you. Something on the surface has been decomposing in the heat of the attic, making the thing all sticky. Now it's covered in dog and cat hair. It's nasty. So I'm talking to this fella at the party and he asks me what I'm going to do with the thing. I tell him "It's going in the trash as soon as I get home!" He suggests I should leave it at the restaurant amidst all the knick-knacks, chotchkies, and "antiques" lending charm to the dining room. Of course we had to make sure mom was properly distracted as we left or she would see the briefcase and there would be a severe case of &nbsp "OH! OH! Lakweesha, you almost forgot your magic briefcase!" in my near future. Right before we left Mom asked if Lakweesha had his magician box. I said, "Yes he got it." and shoved her umbrella in her face and ran into her." 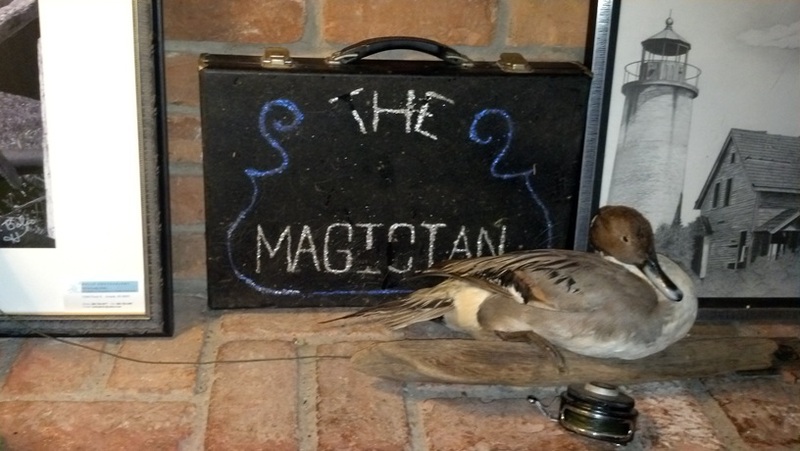 So now the question is HOW LONG WILL THE MAGIC BRIEFCASE REMAIN IN THAT RESTAURANT? It's turned around now, facing the wall. I suspect some customer preferred not to stare at a hairy briefcase while eating. The back of the thing is decidedly less fuzzy, you understand. I think we should raise this to the next level. It's time to start getting photos of people at the restaurant with the briefcase. Maybe they'll put a sign outside, "Home of the Magic Briefcase"!